July | 2014 | What Did You Say? 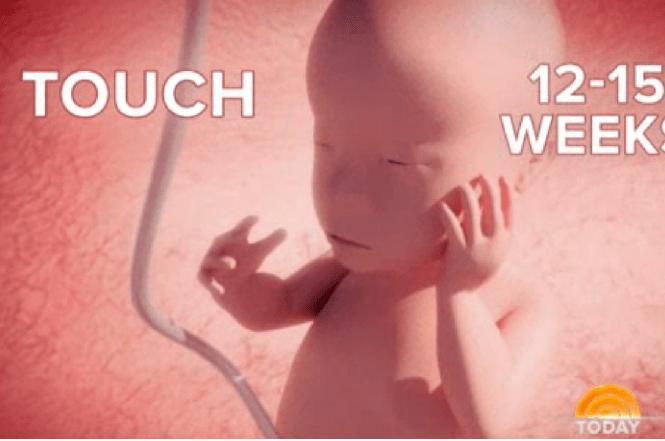 An amazing new video that appeared on the Today show shows life before birth. 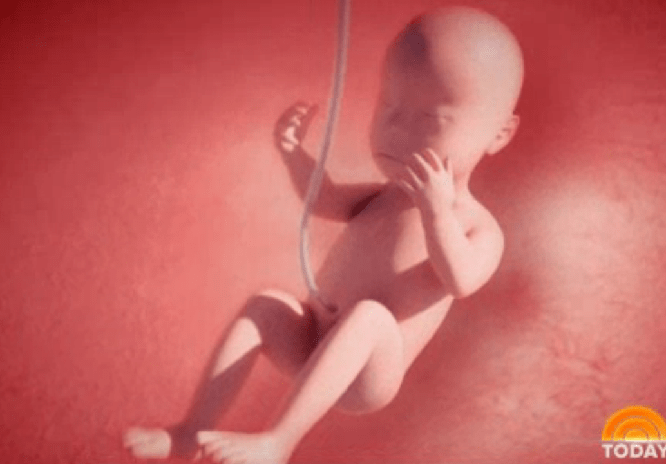 The pro-life movement already knows unborn babies are capable or truly astonishing things and this report confirms it. “They’re exquisitely able to sense information over all parts of their body, although some are more sensitive than others, like around the mouth, around the feet, around the hands,” he continues. Experts say kicking and other activity can be a reaction to mom eating or changing positions; or it might happen just because the baby feels like moving around. “This suggests maternal stress could be having on effect on the child’s behavior in the womb and highlights the importance of reducing maternal stress in pregnancy,” Dr. Nadja Reissland, the lead author, said. The report also discusses how a new study shows even before they are born, babies are learning from experience, especially if it’s directly related to their moms. Babies before birth learn nursery rhymes from their moms while while in the womb. So much for just being blobs of tissue. On Thursday, the U.S. District Court for the District of Columbia offered a ruling that will allow Americans greater insight into the Fast and Furious scandal and the Obama Administration that has repeatedly promised to operate as a model of transparent government. Thanks to a Freedom of Information Act lawsuit by the government watchdog group Judicial Watch, the court ruled on Thursday that documents that have previously been withheld from Congress under a flimsy pretense of executive privilege must be turned over to Congress. For over 16 months, the lawsuit has lingered as Judicial Watch pursued the documents. About a year ago, the court rejected the Justice Department’s request for a hold on the lawsuit that would last indefinitely. The Justice Department had maintained that the documents are protected by executive privilege and that the Fast and Furious scandal was still being investigated. Attorney General Eric Holder was found in contempt of Congress in 2012 after he refused to cooperate fully with investigations into his involvement in the Justice Department operation that allowed untracked firearms to be funneled to Mexican drug cartels while the Obama Administration condemned violence surrounding the border and attempted to blame law-abiding gun owners and gunshop owners for the violence. The president saved Holder at the last moment by cloaking his official in executive privilege. The Fast and Furious scandal has been obscured by this flimsy pretense ever since. The DOJ claims, in addition to other Exemption 5 rationales, at least two distinct forms of executive privilege to justify withholding documents: a “deliberative process” privilege of constitutional dimensions and a “congressional response work-product” privilege. The court’s ruling is likely not the last hurdle to finding the truth about the scandal that left American border patrol agent Brian Terry dead. However, it is one step closer to forcing the Obama Administration to reveal to the American people the truth about the government’s complicity in the outrage. The slavishness with which the Obama administration acted today as a repeater for the Hamas narrative requires calling out here. On Wednesday morning, Hamas launched mortar fire at IDF assets from the Abu Hussein school in the Jabaliya refugee camp in northern Gaza. The school was being used by UNRWA, the UN aid agency, to house Gazans who had fled their homes in recent days because of the fighting. The IDF reported that it responded by firing several tank shells at the Hamas firing position. One hit the street in front of the entrance, according to several witnesses. Two others hit classrooms where people were sleeping, and a fourth struck a house behind the school. The Hamas war crime is only compounded by the fact that UNRWA (United Nations Relief and Works Agency for Palestine Refugees in the Near East; www.unrwa.org ) says it notified the IDF 17 times that it was using the school to shelter refugees. Hamas, which administers Gaza and knows everything that goes on there, and whose guerrilla terrorists were the ones at the school launching mortars, was well aware that Gazan civilians were being sheltered in the school building. Hamas cannot plead ignorance. Its operatives knew quite well that they were committing a war crime by turning a refugee shelter into a combat firing position, thus inviting counterfire on it. There are basically three potential responses to this event. One is to accept and work with the timeline laid out by the IDF. The second is to dispute the IDF’s narrative; e.g., suggest in some way that the IDF was mistaken about the Hamas mortar fire, or that it is lying, or something along those lines. The third response is to simply dismiss the IDF account as though it had not been given, and speak of the event in the terms encouraged by Hamas and Hamas’s sympathizers. In those terms, the Hamas mortar fire is ignored entirely, and what happened was that Israel shelled a UN shelter, in spite of having been warned that it was a UN shelter. White House spokeswoman Bernadette Meehan also said the U.S. is “extremely concerned” that thousands of Palestinians aren’t safe in U.N.-designated shelters, despite being told by Israel’s military to leave their homes. This is the height of irresponsibility. There is no principle of international law or convention that can enforce itself. When those principles are breached, it is some responsible party breaching them. The responsible party in breach here is Hamas. No one has a right to protection at a Hamas firing position. There is no international law or convention that mandates such protection. None of us could defend ourselves against anything if there were such a mandate. That’s what makes it a war crime to wage combat from behind protected persons or sites: the necessity it creates for attacking them. Responsible condemnations of civilian casualties in Gaza should always point back to Hamas’s evil in exploiting this principle to maximize deaths among Gazans, over and over and over again. No matter what the particulars of the incident, the essential factor for which there is no excuse is that Hamas invites fire down on the heads of the Gazan people, by maneuvering its most dangerous activities into their midst. That’s the strategic-level “macro” reality of the conflict as well as the tactical-level reality. The Obama administration not only failed to make that point, but focused on the “shelling” of the school, as if it were a disembodied action to be condemned in its own right. That’s Hamas’s narrative. It’s the narrative repeated faithfully by Hamas sympathizers in the West, who themselves heap danger on the people of Gaza by acting as human microphones for Hamas. It appears to me that the Obama administration is trying to find a middle path of some sort by condemning the “shelling” rather than naming a party for condemnation. There is no justification for this, any more than there would be for trying to find a middle path between condemning al Qaeda and condemning the United States. Perhaps the Obama administration doesn’t realize that neutrality about this conflict is immoral, and inadmissible as a basis for national policy. If that’s the case, it has no business being in the Oval Office in the first place. Or perhaps the Obama administration is just going out of its way to avoid condemning Hamas, disguising that purpose under a seemingly neutral concern about “shelling.” Either way, the implication is damning for Obama. E. Dyer is a retired Naval Intelligence officer who lives in Southern California, blogging as The Optimistic Conservative for domestic tranquility and world peace. Her articles have appeared at Hot Air, Commentary’s Contentions, Patheos, The Daily Caller, The Jewish Press, and The Weekly Standard. READ: Boehner Defends Lawsuit Against Obama In Op-edThe resolution authorizes Boehner to challenge Obama in court for exceeding his authority by unilaterally delaying deadlines under Obamacare. Although he has said he’ll target the one-year delay of the health care reform law’s employer mandate penalties, the text of the GOP resolution gives the Speaker room to legally challenge implementation tweaks to other provisions of the law. READ: Senate Majority Leader Harry Reid: Judge Would Throw Out Boehner’s Lawsuit Against Obama Boehner faces an uphill battle in court. The first big question is whether he can achieve “standing” which requires proving a material injury to the House. Legal experts say that’s a very difficult task because no lawsuit emanating from members of Congress against the president has ever achieved standing in court. The next question, if the courts grant standing, is whether the lawsuit has merit to succeed. Republicans may have better luck on this question, experts say, as Obama’s unilateral decision to delay a statutory deadline is arguably problematic from a legal standpoint. Progressives and some conservative legal minds warn that if the lawsuit succeeds, it would declare open season for the executive and legislative branches to sue each other over any legal disagreement and empower judges to resolve such disputes. Sahil Kapur is TPM’s senior congressional reporter and Supreme Court correspondent. His articles have been published in the Huffington Post, The Guardian and The New Republic. Email him at sahil@talkingpointsmemo.com and follow him on Twitter at @sahilkapur. RUSH: Okay. Ladies and gentlemen, I have just been convinced. I already was. Let me put it that way. I have just had the exclamation point attached to my being convinced that the Obama administration has chosen sides, and the side they’ve chosen is Hamas. AP reports breaking news: “White House Condemns Israel for Latest Attack of UN School in Gaza Strip.” Now, the White House knows, ladies and gentlemen, that Hamas is using schools and hospitals as military outposts. Already three schools have been discovered with rockets. You remember how you found rockets in your school one day, right? Remember that time your janitor showed you. They are planting weapons that they intend to use offensively in hospitals. And they’re advertising the fact. They’re letting the Israelis know that this is where the ammunition that they are using is being stored, schools and hospitals. This is why the Israelis are sending 20-minute warning shots before they attack. The administration knows all this. The administration knows what Hamas is doing. The administration knows where Hamas is putting its armaments. The administration knows that Hamas is killing its own children with this behavior, and yet they blame Israel. And I’ll tell you again, there’s a predisposition to hating Israel, disliking, opposing, whatever, in this administration, there can be no doubt about it now. But then now to invoke the children again, it’s a repeat of what’s happening here at the border. The invocation of children anywhere is used to eliminate and silence and nullify any opposition. So if it is tens of thousands of children crossing our border, shut up, it’s children, for God’s sake, where is your humanity? And let them in. So Hamas puts their own children in known targets. Israel warns at 20 minute intervals, “Get out, we’re hitting the target.” Hamas leaves their children there. “How dare Israel kill children on purpose! Damn those Israelis. They hate children.” It’s clear as a bell what is happening. This is just awful, folks. This is just plain and simple awful that this kind of attitude would be engaged in by us toward an ally. And the Drive-By Media routinely now asks every Israeli guest essentially, “So why are you killing children? Don’t you have any shame? Can’t you stop with the killing of children?” And Hamas applauds. PR victory after PR victory. I watched this morning, does the name Hanan Ashrawi ring a bell? I’ve been watching her, she’s a Palestinian spokeswoman, and I’ve been watching her since the seventies. Imagine my shock when I learned that Peter Jennings had an affair with her during his days as a foreign correspondent, by the way, when he was posted over there back in the trench coat days. Back when every foreign correspondent had to wear the — I mean, obviously the mall had a journalism clothing outfit, store, that was only available to journalists. And in there was the approved journalist trench coat, ’cause they all wore one. Well, other things now. I’m watching this. It’s just everywhere. So as far as these people are concerned, “The Israelis are targeting and murdering the children. How dare they!” And it’s Hamas that straps bombs to their children. It’s Hamas that puts their children in these targets. It’s Hamas that makes targets out of hospitals. Everybody knows it, and yet they continue to report a lie and then challenge every Israeli guest with the lie. Netanyahu is not backing down, but don’t forget now, as I pointed out yesterday, they see Netanyahu as no different than your average Tea Party person. He’s a vile, hateful conservative right winger.